Hungary is looking at another three-day (alright, three working-day) week, but the rest of the world does not go on vacation on Thursday and Friday, hence important data will be published on those days too and investors will not be bored to death. In Hungary, the only piece of data worth watching this week is that of unemployment on Tuesday. 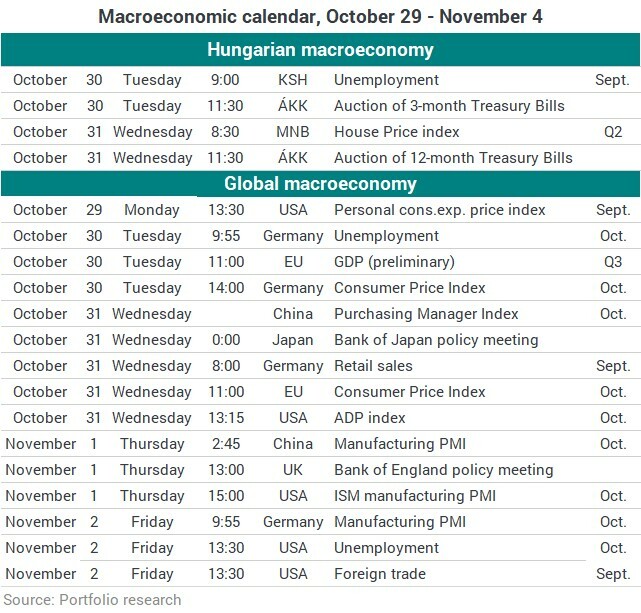 This week and last contains only six working days in Hungary, so we’ll not have much action on the macroeconomic front this week either. Yet, those that keep an eye on markets even during holidays, will have international statistics to watch both on Thursday and Friday, as well. We’re off to a slow start. On Monda, you might want to check a single release in the Untied States, as the price index of personal expenditures is a key inflation indicator, and it could be of key importance for the future interest rate policy of the Federal Reserve. On Tuesday, Hungary’s Central Statistical Office (KSH) is going to release its latest unemployment data, which is the only local macro event worth mentioning this week. In Europe, we’ll have the preliminary GDP data for the third quarter of 2018, which will not include a country breakdown yet, only the first estimates for the Eurozone and the EU28. In Germany, they’ll publish the latest CPI figures in the early afternoon. The National Bank of Hungary (MNB) is expected to publish the Q2 house price index on Wednesday, and the Government Debt Management Agency (ÁKK) could bring forward its biweekly auction of 12-month discount Treasury Bills from Thursday. At dawn, the world and primarily currency markets will be watching a policy meeting of the Bank of Japan, then the focus of investors will shift to Eurozone inflation data and employment statistics for the U.S. business sector. On Thursday, we should not expect major happenings in Hungary, while life will not stop elsewhere in the world. The Bank of England, for instance, is set to hold a policy meeting, while business cycle indicators are in the pipeline elsewhere. On the last working day of the week, investors will be watching mainly U.S. unemployment data that could have an impact on the USD exchange rate, as well. Germany’s latest purchasing manager index figure could have an influence on Hungary too. Preliminary data show that the momentum has diminished.